On this episode of Recode Decode, hosted by Kara Swisher, chef José Andrés talks in front of a live audience at South By Southwest in Austin, Texas. In the course of an hour, the two cover a wide range of topics, including how Andrés’s World Central Kitchen deployed its chefs to disaster-struck areas like Houston and Puerto Rico after last year’s hurricanes, immigration reform and #MeToo. You can read a write-up of the interview here or listen to the whole thing in the audio player above. Below, we’ve also provided a lightly edited complete transcript of their conversation. If you like this, be sure to subscribe to Recode Decode on Apple Podcasts, Spotify, Pocket Casts, Overcast or wherever you listen to podcasts. Kara Swisher: Hi, I’m Kara Swisher, executive editor of Recode. You may know me as the best chef in the world, as long as you only want peanut butter and jelly sandwiches and nothing else, but in my spare time I talk tech, and you’re listening to Recode Decode from the Vox Media podcast network. Today we’re gonna play an interview I did back in March at South By Southwest in Austin, Texas. This is the last of my interviews from this year’s festival, but we already published the others I did with Valerie Jarrett, Christiane Amanpour, Esther Perel, and Maria Shriver with her daughter Christina Schwarzenegger. Make sure to go back and listen to those in case you missed them. This interview is with celebrity chef José Andrés, who has been doing some great work with his nonprofit, World Central Kitchen. It has served millions of meals to the people of Houston and Puerto Rico after last year’s devastating hurricanes, and José has also been a vocal critic of President Trump on the issue of immigration. Let’s take a listen. All right, so, there’s so much to talk about, and you said you just landed, right? José Andrés: Ten minutes ago! Ten minutes ago. And then you’re like, “I don’t know why I’m here,” right? Is that correct? But I have no clue about what you’re an expert on, so I don’t know, I really don’t know what I’m doing here. I mean, it’s a bar, I can handle a bar. Yeah, geeky guy? What’s that? Oh, forget it. Anyway, let’s move on. We’re going to talk about a lot of things. I write about technology but I have an ability to talk about other things too. So long story short, first day I think we did like a thousand meals. And we distributed them around San Juan; a hospital here, a shelter there. But long story short, at the end what we did is we went from one kitchen in the middle of San Juan to more than 18 functioning kitchens at the same time. We opened a total of 23, and we went from a thousand meals the first day to 3.4 million about to reach this week. That’s what happened, over amazing more than 20,000 volunteers, more than 10-foot trucks, helicopters, Humvees, ships, boats, National Guard, army, navy, everybody helping. It was unbelievable. But the most unbelievable thing was that we were not supposed to be there. Well, because we were not supposed to be there. We are not technically a relief organization. We ... we ... even we’ve been going to relief moments more and more. We have a school, we teach women. The news story. So let’s talk about that first. Where are we with Puerto Rico right now? I think Puerto Rico, everywhere I see a problem, I only see opportunity. What I can tell you is that the people — the American people — of Puerto Rico are unbelievable. I mean ... yeah, you can clap! [audience cheers] I get upset when I don’t have hot shower in my hotel room and I call down, “What the heck is going on? 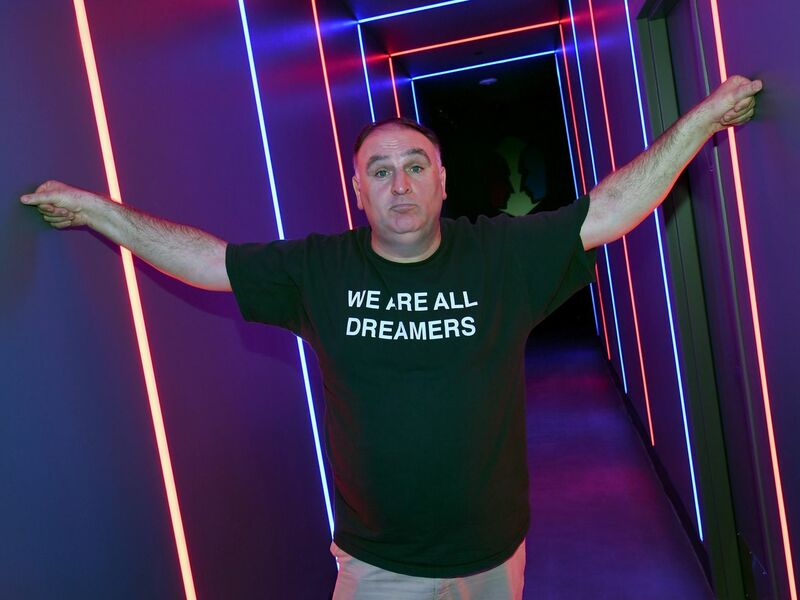 I am José Andrés! I need hot water!” And other times you feel so stupid when you know you have an 80-year-old woman carrying her only bottle of water with her, with the people around her. And you start giving value to things in life and you start really realizing that you can complain about who you are and where you are but there’s others that have it much worse than you. And when I saw the people of Puerto Rico becoming one and working together to start solving the issues one problem at a time, this was amazing. So, you know, I just came back, I think less than two weeks, I go from Puerto Rico and we have my organization, we still have there three kitchens, one in Vieques, which I think we’re doing 400 to 500 meals a day. It’s an island of about 6,000 but we began there very early on, feeding the people of Vieques. We have a kitchen in Bayamon, I think we do 3,000, 4,000, 5,000 meals from there. And then we have another kitchen in the middle of the island in a place called Lares, which is an amazing chef called Ventura. He’s been with us from the beginning and he’s still cooking in the heart of the island. So you know, we are doing 7,000, 8,000 meals a day still today. How would you assess the recovery there and the government’s role in it? The book is called “We Fed an Island”? “We Fed an Island.” And we have ... we have a tendency, obviously, of ... you can make it political very quickly. I think if we go back in time, this is beyond politics. This is not about Republicans and Democrats, even if it’s very easy to have them fight and anybody put you in any side. At the end it’s just American people taking care of Americans in moments of disrepair and moments of need. And this should be apolitical. If I say, “Everybody should believe that in the moment we have a tragedy like a hurricane or earthquake or tornado that America will take care of fellow Americans,” will everybody agree that that should be something that Republicans and Democrats should endorse? [claps and cheers] So why we don’t make it happen? But that’s not precisely what happened there exactly. There was a lot of politics in Puerto Rico. Well, I was in Haiti. Even in Haiti I arrived I think six, seven weeks after the earthquake. And I’ve been there more than 25, 30 times. But on paper, the numbers we can show is that what we did in Haiti was much faster and quicker and we put many more troops and many more assets to the betterment of the lives of the people of Princeton, Haiti, than we did of the American people of Puerto Rico. So in that sense, I will say that maybe yes, the government kind of failed Puerto Rico. We were very quick and very fast helping Haiti. I cannot say we were as quick and as fast helping Puerto Rico. And why was that, from your perspective? I ... I was trying to go to the White House, to the main room where they make decisions, but they wouldn’t let me in. So I don’t know what was going on. Did you actually walk up to the house? The truth is that, let’s put it this way: The people of the federal government, the men and women, the people of FEMA, the people of the military, they’re the best people out there. It has nothing to do with them. They work 24/7, they leave their families behind. Sometimes they pay things out of their own money, out of their own pocket. They do ... every one of them is a hero in their own way. Every single person that goes to these moments. But the truth is that the system, sometimes, doesn’t allow them to be successful. On the first day that we were there, we met people from Homeland Security. And these people that are what they call HSI, which they do investigations in the frontier, and people of what we call ICE. Who is going to tell me people of ICE were going to become my best friends? Unfortunately the role is to be kicking out undocumented immigrants when they think they shouldn’t be here any longer. But those were amazing people. And they were going around the island bringing security and kind of assessing the situation. But very quickly we saw that they were only bringing water. And they saw that we were making sandwiches. And they were like, “José, can we bring sandwiches?” Sure! We needed people with distribution. They were our first distributors across the island. So every morning it was beautiful to see 40 Humvees, 40 Jeeps in line in front of the restaurant with all our teams and volunteers and chefs filling up the backs of the Humvees with as many sandwiches as they could take. We did this probably close to three months. Probably more. And this only shows you that, sure, everything works, but you know the decision was not made at the top. The decision was made at the bar at 11:30 pm with a rum sour. Sometimes you have to adapt. And it’s funny to me that I was able to meet those guys in the hotel they were staying after 16-hour work days, and right there, things will happen and we will make a quick plan. And that to me shows me that sometimes the bigger problems have very simple solutions, and that sometimes we make the problem bigger by not taking action. Meetings, meetings and meetings. And then let’s do another meeting in case the previous meeting was not clear enough. Okay. This may work for some people. But when you’re talking about hunger? And you’re talking about feeding people? What are you going to wait, three weeks from now? Thank you, you don’t have to feed anybody else, everybody is dead. It’s as dramatic as that. When people are hungry, and especially when American people are hungry, the urgency of now is now. That means no planning, it’s just cooking. And sending the food to the people in need. And do you feel that there needs to be more attention there still? Because again, the attention has dropped off. I think the stories are there. I think the governor overall has been doing a good ... just, it’s been hard work. But Puerto Rico is a political problem, but can become an opportunity. If it’s a part of America it needs a Marshal Plan so we help Puerto Rico to be where it needs to be. And I think that’s possible, but we need political will. I hope that with the many Puerto Ricans are with voting rights in America where their vote counts, knowing Puerto Rico and the island, but in Florida and New York I thought ... I think they should be very active voting to make sure that the voices will be heard, in November and in the years to come, so one day Puerto Rico and any other place in America deserves what they deserve when they should deserve it. But Puerto Rico is kind of ... right now it seems, yes, it’s a second thought. And, you know, I’m not a political guy. The only thing I tried to do was making sure we feed as many people as we could. And now we’re helping some farmers, we’re trying to bring water, and more important, we’re trying to get ready if another hurricane happens in September, October, let’s hope it doesn’t happen, that at least we have a plan. Right. Now you say you’re not a political person, but you’ve gotten in some tangles with the Trumps still this year. Yeah but that’s fake news. I have ... I respect my president, which is our president. We don’t all like the same music and we don’t all like the same foods. You know. But we like people liking other foods and people liking other musicians. That’s no different with a president. I think the potential of improvement is huge, and that we should celebrate. Okay. For some reason I don’t think you like a well-done steak. We’re going to take a quick break now for a word from our sponsors. We’ll be back in a minute with celebrity chef José Andrés. One of the reasons you had the fake news with him. Recode. Can you talk about that? Your ... the immigration issues. You know, immigration, I’m an immigrant myself. I think everybody will agree that America is a nation of immigrants without the permission of all the people who were living here before. But America is a nation of immigrants. I’ve been an immigrant all my life, even in Spain where I come from. I never belonged to a place because very young, my family moved me from one place to another. So I was always a foreigner in my own country, but I always was welcome and I always was given an opportunity. In America, if anything, for a cook, which is the melting pot of the world, imagine. This is the perfect place to be a young boy. But immigration is a very clear thing. It’s a big lie, what we are living right now. We cannot in one hand look to the other side when there we need people to work on the farms or in the chicken factories, and let them in, but when that farming season is over, then we wanna kick them out. That’s not the American way. On the other hand, you know, we wanna have our greens and our golf clubs perfectly clean and beautiful so we can hit the stupid ball and put it in the hole — I play golf, but it’s a stupid ball. And those guys working are undocumented. The real American way should be to give opportunities to those men and women who are part of the DNA of what America stands for, an opportunity to belong. They’re already here. So why are we living this lie where every single salad every single senator and every congressman are eating on the hill probably is being picked by an undocumented? That’s the big lie. And the American way is to be pragmatic. I think America has been the most pragmatic of all countries I know. A lot of things to improve, but things always seem to be moving the way forward. Immigration reform is not a problem for us to solve but an opportunity for us to seize. My restaurants don’t have enough people. I need to be hiring more people and sometimes I don’t have the workforce to be hiring. We need those 11 million-plus undocumented to be part of the American dream, because right now they’re ghosts. Even they’re the ones helping us run many parts of our lives. And especially the Dreamers. It’s insane that the Democrats and Republicans — and let’s face it, Democrats got also control of the White House, Congress and Senate and also nothing happened. So if we want to be pragmatic, we need to be asking Republicans in charge now no more but no less than we should also be asking the Democratic leadership. That very much arrived here in diapers, that they’re as American as you and me, that they’re not given the opportunity to really keep making America better is just insane. And just to try to think we’re going to be kicking them out is just unbelievable. What do you think it going to happen? You’re involved politically. It’s very hard right now because this presidency is very fluid. And I like fluid. But I like fluid when you know a little bit where the river is going. Within the river you can be moving, but there is a river to be followed, but this is like ... but the truth is that this is beyond a president. I do believe I’m expecting much more from the leadership on the hill. And what should be happening is a true immigration reform. They’re talking about a wall. Listen, everybody lies to a degree, no? Some people want a wall, right? We all know that walls, you know, they’re not going to achieve anything. Really, they’re not going to achieve much. It’s just a great way to put a physical way to put a wall between people. The best we can do is not building walls but investing in the countries around us. If we invest in Haiti, we will not have people trying to come on boats to Florida. We keep investing in Mexico, we’re not going to be having more Mexicans coming to America undocumented. And what we should be doing is smart visa systems where we can have this revolving door where people can come, work the farm and go back to their country. The vast majority of the people, they want to live where they are from. They don’t want to be separated from their families for years. They want to see their children grow. They want to be where they belong. But if they have opportunity to come to America and help the American economy do the farming and next year they know they can come back when the okra or wheat or corn season happens again, that would be smart business. For me, it’s very amazing that our leadership in the hill are not coming up with those quotas of visas that are smart for American business, especially small business. Sometimes we need workers that we cannot find. And every day, right now, we are in close to what is called total employment. The employment is so low — the unemployment — that every day it’s more and more difficult to find people. So let’s talk about the food business. Now you’ve been in ... how long have you been doing this? Since my mother fed me the first time, I’ve been in the food business. I don’t remember the moment but I’m sure it was good. Okay. What ... what’s changed recently? I wanna get into a little bit of tech, but what is happening in the food business right now from your perspective? I think for business it’s probably one of the most fascinating businesses you can belong to. I have a class in George Washington we created a few years ago which the idea of the class was to show that food very much touches everything that we are. Food is history, and if we don’t understand that then we don’t know who we are. Brillat-Savarin said — the French philosopher in 1826 — “Tell me what you eat and I will tell you who you are.” But he even said something more important. He said, “The future of the nations will depend in how they feed themselves.” Powerful phrase. Food is a science. We teach a class at Harvard where we teach physics through food. Food is the DNA of who we are. Food is hunger. Food is obesity. Food is politics. Food very much touches absolutely everything. So in this moment America itself, more than around 15 percent of the American economy relies on the food business. Between farming and restaurants and distribution and food production, and I think the moment we are living is an exciting moment because it is full of challenges but full of opportunities. By the year 2050 we’re going to have to feed nine billion people. And we need to crack the code in how we are going to be doing this in a way that is logical, is sustainable. We can do it. And especially, the most important thing to me, something that we make sure that every single person has a chance, has an opportunity to have a humble plate of food. That’s something that is achievable. We are able to produce enough food to feed everybody. We only need to make sure that we are able to get to them. I do believe that is very naïve if you go to a food conference, and I fight with many of my friends, chefs, that they think everything has to be local and organic. Because in the moment they are telling me — and probably some of you here are the same way, and I used to be that way not too long ago — but when we say “local and organic” the same person is telling me this, the jeans he or she are wearing are from Cambodia, and is drinking a bottle of champagne that happens is from France from 1997. That’s not seasonal, and that’s not local. And obviously doesn’t entitle you to give me a talk about seasonal and local, you moron. Is that how you open the conversation? So we need to be pragmatic in the sense of we’re going to be feeding nine million, we need to be open to the many ways. So impossible meats is a great thing. Actually happens I tasted for the first time this over two years ago. And in one of my restaurants, Beefsteak, we’re about to. Which is my best of all fast-food restaurant. We have like six, seven now. We’re about to put it. They came up also, the guys of Just Mayo, they came with these eggless soy base that behaves like egg. You can make scrambled eggs or you can make an omelet with a vegetable-based liquid. It’s fascinating. I’m doing a vegetable book right now — that’s a commercial. It’s going to be released next year. Yeah. But I love it. It’s opportunity. I much prefer that than the turkey for Thanksgiving that happens is fake news because it’s made out of tofu. What the hell do you have to make tofu look like? Poor turkey. Do you ask the tofu if he wants to look like a turkey? No. Why tofu cannot look like tofu? Just so you know, it’s called Tofurkey. Tofurkey? Pfff. Give me a break. I don’t like tofu personally, but I respect somehow the people that do. I don’t have many friends though, but ... No, no. I do believe that’s the future. It’s great things happening. Many people are doing, in the roofs of every building, gardens that produce vegetables. Right now it’s companies investing heavily in farms that they’re going to be near cities, which I think is very smart. Which is the stack farming, hydroponics, where many of the tasks are going to be run by computers. A lot of things are happening, and I think that’s good news. What do you think of ... you think that’s good news? This is amazing news. Because we need to feed nine billion people, maybe more. We need to be attacking from all levels. It’s always going to be a space for conventional farming, it’ll be different prices. But we need to be attacking the food sources, how we’re going to keep feeding humanity in a super smart, constructive way. Me, very much, I endorse almost everything. We only need to ... hydroponics is something I think is great. I just came back from Puerto Rico where I think helping a farmer where we wanted ... he’s one of the best guys there doing hydroponics and he’s very happy to share his experience with every other Puerto Rican that wants to have a farm. Great news is that in a very small space of land he’s able to produce 10 times more. So that’s smart business. So there we’re doing this kind of school, supporting him, so he can keep sharing the know-how with other farmers who want to do the same as he’s doing. The first person came in, Senator Patrick Moynihan, the beloved senator from New York. Very much we were empty, and we will not take any reservations. We were empty because I was an excellent chef but nobody knew about it, and we were in a part of town where there was nobody after 4 pm and at 5 you had the guy across the street selling me a white powder, telling me, “Hey boy! Baby lookit, that’s good powder, man, good flour.” And then oh, man. That’s the neighborhood. That said, we would take anybody coming in. We began changing to take some reservations, but then we will take walk-ins so we will always know that people could believe that they will eventually find a table. If you come to this part of the world, we will feed you. Then we get OpenTable coming in, and that’s going to change the business forever and ever. Big percentage of our reservations now go through OpenTable. Now they are the main guy, the only guy, very much. I believe that they charge way too much; I believe now that they are taking advantage. But at the same time, it’s fascinating what they were able to achieve. I’ll talk to them. I’m seeing the CEO this week. It’s going to be more competition. It’s coming. Already is Tock, which was created by a restaurateur in Chicago, Alinia, but it’s more for high-end restaurants and you prepay. Resy. The game is going to be changing, but it’s always good. You get one company, three more follow. What about how restaurants are going to be? Like, what do you imagine? You just were talking where you’re opening a restaurant in LA. How do you look at the restaurant, because so many things are become analog. People don’t go shopping anymore, they use Amazon, they ... lots of things have changed in the way people consume. Restaurants are an analog experience. Or maybe they aren’t? How do you look when you’re thinking of the restaurant of the future, or the kitchen of the future? I, right now I am totally lost. I think I have a clear path but then I’m lost. Obviously I have a very big spectrum of restaurants. How many do you have, total? Like 31? 32? Then I have my food truck that we can do sandwiches for $6, $7. And we’re about to open the first brick and mortar in Disney. I wanted my life to be with Mickey Mouse, we’re about to make it happen, and it’s called La Pepa, which is this blue woman living in Spain that she has the best time of her life every second of her life. La Pepa. Sandwiches. Although, all the way to Minibar, which is $450 per person. And in between? Everything. What I do believe is that at the end, restaurants are very basic. If you provide good food, good service, at a price that people feel is the right thing and that sometimes align with the people’s values — unwritten values, but it’s the perceptional values? You will do well. You apply that with a location, location, location, and you’re in business. Location, location, location in this world is, to me, still the most important thing. But in the old days it used to be the corner of the street you open; now, location has moved in different dimensions. Now it’s also, are you in the right platform? Are you in the right food-ordering online platform? Now ... Location used to be just the physical space, but now it’s almost like Matrix. You have to be location, location, location in very different areas. So it has made it a little bit more complicated, but at the same time, if you have a small restaurant and you do a great job, you’re going to have lines outside. You’re gonna have lines outside. So I wouldn’t imagine food is changing — then we’ll get some questions from the audience. What about food? Where is it going? What are the trends, the biggest trends you’re seeing? Your latest restaurant is focusing on what? So I think the food trend is more and more vegetables are going to become part of the human diet. So the China study or whatever? Especially in America, we see the trend. I see the trend for the last 25 years. My restaurants more and more are becoming vegetable restaurants. More and more vegetables are being ordered, and I love them. I mean, think about it. You put the steak in your mouth five seconds you look like a lion, five seconds the flavor is gone and you are still 30 more seconds without being able to talk to anybody. A piece of meat that at that moment looks like a shoe. A vegetable, a pineapple, you put it in, it’s elegant from the beginning almost to the end. What the heck are we eating meat still? That’s why women seem to be eating more vegetables than men. Cause women always are smarter. Men? We are stupid. We are 30 seconds at a time from our lives ... and it’s a reality. So I think vegetables is a simple trend. And the way to produce those vegetables at a bigger scale, sustainable. I do believe that the farms are going to come closer to the cities. Yeah, I would agree with you. It’s going to replace the parking lots we aren’t going to need because we’ll have self-driving cars. Well, or even, at one moment, it’d be fairly affordable for you. Right now, I don’t even buy herbs anymore. Because I have these pieces of nice equipment that very soon I can even check when I’m traveling if the dill and the parsley has water and if I have to add nutrients. I am feeding my plants while I’m in Hawaii on vacation. I do now make plants now in a little hydroponic. You can save money, you can have fresher herbs, and you don’t have to grab the car because the recipe ain’t going to work because Gordon Ramsay told you that you have to have dill and parsley and mint. That’s going to be happening. That’s going to be happening more. So, do you imagine computers ever replacing chefs? Oh yeah. It’s already ... very early on in my life I used to go to MIT, and inside MIT they had this thing called counterintelligence and anything was technologically advanced about cooking, they would have it there. Already they are testing hands look like robots that you have for the ingredients in the right place, you put the programming, you cook, the computer recreates all your moves, they’re able to download this into those mechanical hands, and that robot is doing exactly the same dish you were able to do. Being José and quite frankly, I cannot wait so I can be playing golf! You and Donald Trump together, that’d be great. I don’t think that’s going to happen so soon. But I wish it happened! I’d be the first one to clap if he passes immigration reform, and he helps the people of Puerto Rico and he achieves peace with North Korea, I’ll be the first one to clap. But you were asking me about things happening and technology. You know the biggest thing happening to me in Puerto Rico? Is you to see how we should be using more technology in moments of disasters. Even something like WhatsApp. I never really cared about WhatsApp because now it’s so annoying. You see how many ways we can get messaging now? Twitter and Instagram and the Redmessage, now. And I receive this Redmessage, “I need to speak to you.” And I’m like, “Who are you?” And but it’s important, okay. And then text and then WhatsApp and then email and then company ... it’s like you’re being attacked from so many angles. But WhatsApp. We needed to move quick and fast. We began doing the groups. That were necessary for the task. The group of shopping, the group of food production, the group of fuel. And only you had there the people that needed to be there, no more, no less. And everything was very quick. A phrase, a request, a yes, or no. Efficiently. There I saw the value in this case a platform like WhatsApp, where before I saw like, man, another platform to text. I saw the true value in this case to be quick and effective, providing food to the people in need. So you haven’t gotten to Slack yet, have you? Do you know about Slack? I don’t know what the heck this is. I was waiting to see if she was now going to ask me again. What the heck is that? It’s like WhatsApp groups. It was first, kind of. Ah, the beginning. Is Slacky. We run our whole company on Slack. Slack, not Slacky. Wha ... can you invite me? My pronunciation is kind of ... I fake it. You’re not actually Spanish, are you? We’re going to take another break for a word from our sponsors. We’ll be back with José Andrés after this. Let’s get some questions from the audience. Right here, sir? Questioner 1: It’s hard to believe anything that a politician says publicly, but I wonder: Without naming names, what are the most hopeful and the most dire things you’ve been told by a politician kind of behind closed doors about the future of immigration? Well. I’ve been in the hill and I’ve been told by senators and congressmen that, “Don’t worry, we will increase food stamps,” and then going and that person voting against it, and then they tell you a hundred excuses why they did. On immigration, exactly the same. I’ve been very lucky at times to host Republicans in my restaurant and Democrats in impromptu off-the-record lunches or dinners. Sincerely I do believe that they all care about the issues. But this one moment, when they get up to the hill? That becomes an impossible game to understand. No. I’m telling you I’m going to do something and I’m doing it because I believe in it. I’m not expecting anything else in return. I don’t mean by that bribing or anything. I mean that, at the end, when somebody commits to something, it seems they’re trying to leverage that to achieve something else. And that makes the whole thing impossible. But at the same time, we need to be solving one problem at a time. We could agree to disagree what’s the best way to protect America, with a wall or without a wall. I think the best way to protect America is building walls; I agree with Mr. Trump. We need walls. I only wanna use those walls in a different way! I wanna build hospitals and schools and community centers and that’s a smart way to invest in walls. And any time we help undocumented here, the money they can send overseas? If they’re improving the lives of their people in the countries around Spain and anywhere around Europe or anywhere around the States, my daughters are going to be safer because those other people are also doing well. Every man and woman only wants one thing: That the children are doing well. If the children are doing well, they’re happy. So what we need to do is provide the same to others as you and I want to provide to our own. If we do that, the world is going to be a very happy place. Questioner 2: So being from Houston and being in the restaurant industry, I would like to first extend our thanks and our gratitude for everything that you did after the storm and the floods. We certainly appreciate it. We couldn’t have done the recovery without you. We know that there will be another storm. There will be another disaster. We’ve also seen that your methods tend to be more effective and more immediate than what the government does. So my question to you is: Other than giving you money, which we should all do, what can we do to help to be prepared for the next time? Because we know there will be a next time. Thank you. It’s a lot of different issues, right? But the one I know, which is food, is a very simple issue. I wish I was in Katrina and I wish I was in the Superdome. I have, sometimes, nightmares about it. I wish I took the initiative I took later in places like Haiti and others. Because think about it: An arena? What is an arena? It’s a sports venue. It’s a music venue. No. It’s a big lie. It’s a big gigantic restaurant that happens to use NBA players as entertainment. Think about it. So the only thing we had to do in Katrina was send in three or four Sysco U.S. Food trucks, get an army of cooks like me willing to help, activate the kitchens inside the arena, boom. No more problem, food. Now we can take care of toilets and showers and beds and security and electricity and everything else. So imagine how simple it is, right? So me, what I’m trying to do is precisely that: How to plan that we can activate the resources. People want to volunteer like crazy. In the fires in Ventura we got more than 2,000 volunteers in less than a week. People love to activate themselves to the betterment of the lives of others. Makes them feel good, but they really have that call to help others. So activating the volunteers through different platforms, that’s going to be very important. Activating over like systems, kind of we are talking to them, believe it or not, through their ears so people know who is producing the food, people know who is delivering the food, and people know who is receiving that food. Platforms like this right now don’t exist. We were delivering medicines. We were delivering medicines because nobody knew who needed the medicines or where those medicines were. So we’d pick up the phone, call Paul Farmer from Harvard, partners in health, and say, “Hey, I need medication because this doctor is doing transplants and he has no medicine for transplants.” Boom, 24 hours, a plane came, we got it, we gave it to him, problem solved. We need just to make the big problems that seem big, we need to simplify them. It’s enough manpower, womanpower, technology to do it. We only need people to stop meeting so much and that they have the plan before. When the emergencies happen, plans should not happen. And more important, we need to have special teams. When something happens that we never planned for, we need to adapt. If we have that, anywhere else in life, every day, why can we not have people that are professionals at that adapting to new circumstances? Would you like to run FEMA? I said before, the men and women of FEMA, everybody is the best people out there. Do I sometimes — after two rum sours or three margaritas and three gin and tonics have dreams that I wish they told me to be the food tsar for Puerto Rico so I will have everything at my disposal to be a true general of food, to make sure that food will not be a problem anymore? Did I dream of that moment? Yeah. But like me, hundreds of other chefs, every day we adapt to new circumstances. You know what I did? I sent a WhatsApp to Fidel from BonAppetit, a big ... one of the best companies in California for food, and I said, “Fidel, I need the best men and women you have in food production.” He sent me, in less than 48 hours, some of the best chefs that America could have. They came, and they became the delta force. With all of them, we were able to open more than 18 kitchens in less than two weeks and a half. Look at how simple it is. If you need to feed America, bring the chefs, because probably they’re going to be the ones that know how to do it quick, faster and efficient. Chefs with WhatsApp, though. Okay, now two more questions we have time for, very quick, and then we’re bringing on Melinda Gates. Questioner 3: I was wondering if you could explain the challenges of serving tapas to Americans? No. 2, forks and knives really were invented for protection. Especially men, we’re stupid. So the fork and the knife will be standing up, protecting the plate when humankind was fighting for the food. After we became more food ready, the fork and knife really became utensils to be used to cut the meat and other things. And the most important thing was, when we opened, especially in Washington, people had the problem with sharing, believe it or not. And I just understood that the problem was based on 20 inches. If you put the plate in the middle of the table, you encourage everyone to share. But if you didn’t want to share, move the plate 20 inches towards you, raise your fork, raise your knife, and we are not a tapas restaurant anymore. But that’s mainly the challenges. Beyond that, it’s a great way of eating. You share. And I love to eat many things. I love the rainbow. I like the clouds, but I prefer the rainbow. More color is better. More food is better. I get bored with one flavor. I want plenty of flavors in my mouth, through the course of a meal. So tapas provided all of those things and that’s why tapas has become so successful and goes beyond the Spanish food. Call is mezze, call it sushi, it’s always tapas. But you know ... I hope that answers ... are you opening a Spanish restaurant? Questioner 3: The mezze thing is very relevant because I’m Lebanese. Oh! I have a great Turkish Lebanese restaurant, Zaytinya, and we open in Texas. Go Cowboys! One more very quick question, then we have to get to Melinda Gates. Anybody else? Do you realize that we only let men ask questions? Oh! No! No I didn’t! Women didn’t ask any questions. Sorry, we’re going to do that. It’s because you know all the answers. And that’s why we love you. Okay, is there a woman who wants to ask a question? Sorry, I have a hard time seeing everybody’s gender. Questioner 4: I have one. Questioner 4: I think the one issue that we haven’t asked about is the #MeToo movement in restaurants. Questioner 4: Mario Batali and so many more, all the covers that Eater has done. How are you moving forward in your restaurants to handle harassment? Zero, zero, zero. It’s no more time. No. 1. No, I love these. Listen. No. 1, I have three daughters. That doesn’t make me ... but in my head as a father I want the best for my daughters. No. 2 is being aware that that has been happening and now super aware. No. 3, I am a #MeToo movement in support. This is not restaurants. This is society. This is community. Let me tell you: Who feeds the world? If you go to Haiti, if you go to Cambodia, if you go to Kenya, the challenge of feeding humanity relies on the shoulders of women. Unfortunately they cook with charcoal, they get sick in the process, they carry their babies as they’re cooking. Women very much carry humanity forward. Feeding them, feeding us, and making sure that humanity has a future forward by keeping moving the species forward. One person at a time, one woman at a time. Do you have that in your restaurant? Have you instituted stronger ... because, you know, the restaurant business does have a macho guy kind of thing going on. But listen to me. I’m not going to say that my organization is the Vatican and it’s perfect ... uh, not like the Vatican, we can’t use ... But! Far away from that. In my restaurants, I am very lucky in the sense that in the last few years they have a CEO that it happens is a woman, Kimberly Grant. And between my wife, my daughters, and my CEO, she keeps me straight. And in my office, in my headquarters, it’s full of women. That they keep me and everybody else straight. But at the end of the day it’s very simple. Yes, it’s about women, but it’s also about men, that they’ve been taking advantage because they were gay or because ... it’s about basic human respect from each other. And at the end, we can be creating rules of engagement in the workplace. But in the end, we need to be all with agreeing that especially women, they only deserve our respect. And again, it’s up to everybody to be checking on each other. When I’m listening to the things we’re listening to right now, I’m always wondering: Who is around allowing those things to happen? Where are the roses and the chocolates if you wanted to propose to somebody? What’s going on these days that seems because the digital days we send a heart and we are ready to do whatever we want with that person? Long story short. In my restaurants, I don’t know if we are perfect or not, but I know we have a very good human resources system of addressing this. But we cannot make it in a way that becomes kind of a structure that is so rigid that is corporate. It’s humanity. It’s making sure I take care of you so you take care of me. And making sure that if we see something, we have to say something. And making sure that everybody feels comfortable enough to speak up and that they have a place that they can come to us for help. But we cannot be allowing this to happen. I think ... I don’t know how this took so long to happen. I’m happy that it finally happened. Again, as a dad of three daughters that are finally about to become a part of the world on their own ... And again: Men, we have a responsibility in this 21st century to be more active members of being the best partners we can to women and to anybody that feels that somebody is taking advantage of. Every man is going to have to be there fighting. Everybody’s been doing it, but again, not restaurants. Every single business. Obviously we’ve been having this conversation. Are we giving people the opportunity to have a place to come for help? Are we giving the opportunity to people to speak up without feeling they’re in danger? But that’s where I’m saying we all need to be alert. We all need to be alert. And everybody should be speaking up. And if anybody feels like somebody has done something, everybody should be speaking up. And what I hope is going to happen with everything we’ve seen is that, especially women, they’re not afraid anymore to speak up. And that’s what I hope is going to happen. But it’s not only up to the woman. It’s up to every single man or strong person in that tribe that that’s how we need to live our lives as we preach. Me, I’m not a perfect guy. I scream sometimes more than I should and I raise my voice and I’m unfair more than I should. But I aim to be a better person and I aim to be a better guy. But everybody is going to have to rethink their morals and rethink what’s your engagement with others. And to this day I believe that our society has failed especially women. And it’s good that this conversation has become so public, and again, I repeat: It’s up to everybody to check on everybody. If you see something, say something. Don’t look to the other side. We’ve been going silent for too long. And again, we need to separate the legality of things like every company runs through human resources versus the practicality of human relationships. But it has to come from the top. It needs to come from the very top. Totally. But my point is, do we have no harassment of any kind should be allowed? Totally. Not too long ago, in my Christmas party, I’d been having a long year and I got my top team and I apologized if in the last few months I’d been very hyped and raising my voice more than I should. That’s another form of harassment. Most people would tell me, “José, that’s okay. Don’t worry. We love you.” But it’s okay that you are aware and that people check on you and that you also recognize. But on the sexual harassment issue, this is unacceptable. Everybody should be especially protecting women, and men, yes we should be doing more. Totally. Okay! Great. José Andrés. Thanks for that question. José Andrés.